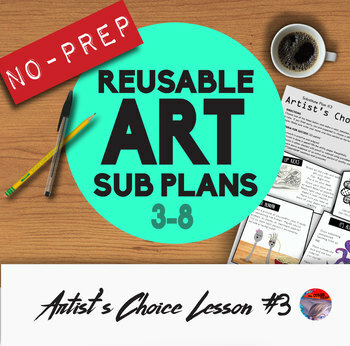 Art Sub Plans #3 - Reusable & No-Prep! Now available as part of a Bundle! Combine and save! Spend your sick days feeling better - NOT prepping for a substitute! 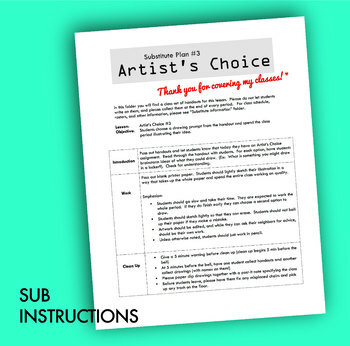 This listing is for the third in a series of reusable art sub plans, called "Artist's Choice #3". 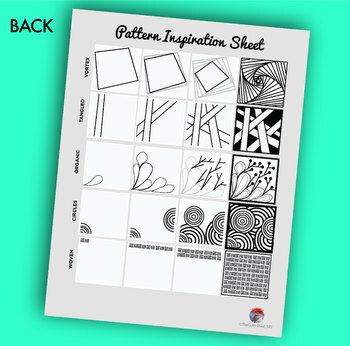 In this lesson, students choose from four engaging drawing prompts, one of which includes step-by-step instructions. Students are given clear directions and criteria, so that this lesson is guaranteed to take an entire class period. These plans are suitable for grades 3-8, no need to create separate plans for each class! *NO PREP! * Using the set up guide, once your "Emergency Sub Plans" bin is organized, you don't need to make copies, leave out plans, anything. Simply call in sick - that's it! *REUSABLE! * Because this lesson involves student choice, you can reuse this plan multiple times and students will still be engaged! • Sub Plans are designed in Illustrator and cannot be edited, but Substitute Instructions are included as both PDFs and editable .docs. • While this plan is reusable, it is not advisable that you reuse it on consecutive days - maybe a couple times each year. • Just as with any lesson, there will be kids that speed through this. 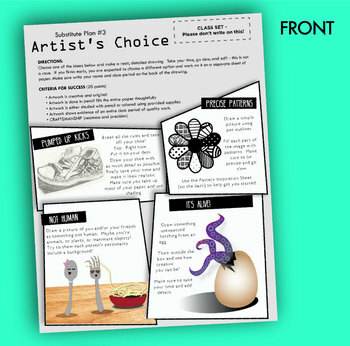 The lesson instructs those kids to choose a different prompt and work on a second assignment.